Pen helps design and facilitate meetings and events for more engaging, effective and creative results. Listening carefully to discussions, Pen uses pictures alongside words to summarise and ‘play back’ key messages until shared agreement is reached. This enables organisations and groups to clarify issues and develop a shared view of the wider context, saving time, energy and promoting ownership. Pen’s template designs help structure the feedback, collation and analysis of multiple views or findings. Following events the graphics are used in reports and on websites, some organisations choose to review progress by revisiting original wall charts in future meetings. Pen also delivers training in graphic facilitation and recording skills. While graphic recording results in useful meeting documentation, some organisations also find it useful to have a more targeted or finished product that will enable them to engage a far wider audience. 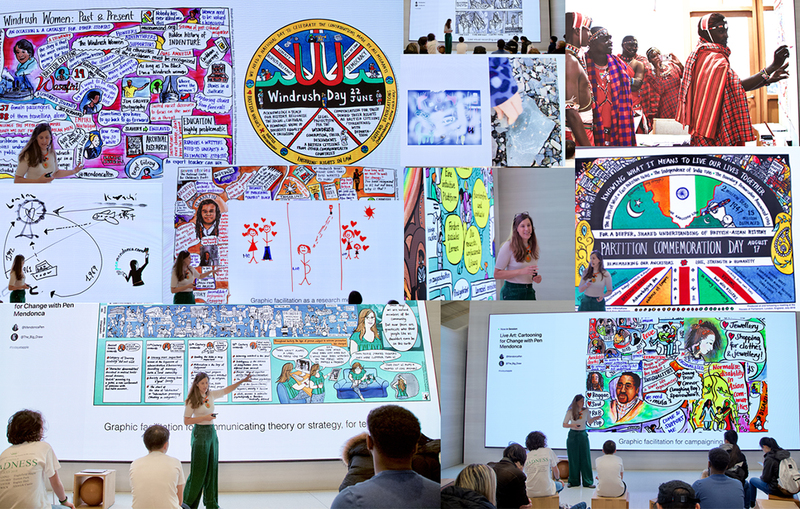 Pen produces original organisational visuals following meetings, events and/or from complex documents, including mapping the history of social movements, producing strategies, visions, plans and overviews. Pen is an experienced and versatile artist communicating ideas through writing, drawing and storytelling. Pen produces original work that is customised to each organisation or project’s needs, working with groups to help them clarify exactly what is required. Pen has a particular interest in the representation of diversity and difficult subjects. Her work reflects the culture and make up of communities and organisations with insight, sensitivity and, where appropriate, humour in order to challenge oversimplification or tired stereotypes.